2016-17 School Year: President – Carl Hagen, Vice President – Jean Meyer, Secretary – Rita Timewell, Treasurer – Jerry Galloway, Advisor to President - Steve Healy, Board Members – Chuck Burns, David Cooke, Stephanie Carlson, Peter Wolfe, Maggie Bush, Gerry Ulm, Steve Healy, Julie Clark, Bob Verzello. Outgoing Officers: President – Charlie Wiglesworth, Secretary – Rita Timewell, Treasurer – Jerry Galloway, Advisor to President – Bill Snodgrass, Board Members – Taylor Landaker, Debi Harlow, Mike Pettibone. 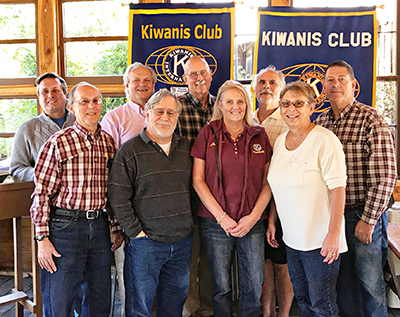 The Placerville Kiwanis Club was chartered in 1956 and has grown to include many unique individuals, business owners, local agencies, and elected officials. Members collectively volunteer more than 3,000 hours every year in a variety of school and community causes, including Academic Decathlon, Easter Egg Hunt, City of Placerville Fishing Derby, and much more. Money raised through their annual Pasta Feed and Studebaker Wheelbarrow Race help support six high school scholarships and the Central Sierra Regional Occupation Program for Culinary Arts. Placerville Kiwanis weekly meetings are educational, fun, not mandatory, and provide amazing networking opportunities. Guests are always welcome to attend the first, second, third, and fifth Wednesdays each month at noon and the fifth Wednesday each month at 6 p.m., at the Smith Flat House (2021 Smith Flat Rd. Placerville, CA 95667). For more information about the Club, visit Placerville Kiwanis Website. For questions and information about how to become a member or visit a meeting, contact info@placervillekiwanis.org or call Carl Hagen at (530) 957-0149.